Have an upcoming event or party in the Anchorage area? Maybe a fundraiser at the Millennium Alaskan Hotel Anchorage? Or a corporate party at the Bayshore Clubhouse? You might be surprised to discover that arranging for the biggest names in entertainment to appear at your Anchorage event is easier than you imagined. 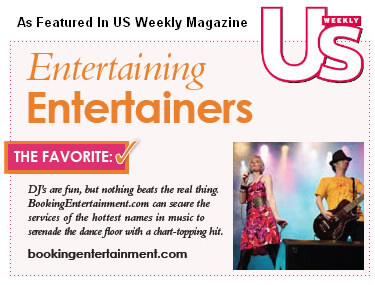 For over almost twenty years, Booking Entertainment has been providing full service turnkey concerts for clients looking to book headline entertainment for their Anchorage area events, providing everything necessary in one, no surprise price. Almost any entertainment choice is available to make your Anchorage area event a success, and no matter your venue, we cover all of the details that go into producing a live entertainment show for your occasion. These details include fees, flights, hotel accommodations, ground transportation, staging, sound, lights, backline equipment, per diems, misc. rider requirements and an onsite team to produce the musical portion of the event. But with all of these responsibilities handled flawlessly by Booking Entertainment, the clients can relax and enjoy their favorite act with their guests. Ready to begin? Let's start with our easy, no-obligation Entertainment Request Form, through which you can answer some essential questions about your Anchorage area event. Within twenty-four hours, an agent will make contact to discuss the process and answer any additional questions. Once the right act has been narrowed down, the agent will come back with a turnkey price for everything mentioned above. At this point, clients can confirm that they want to move forward and the agent will send the formal offer to the talent. If the offer is accepted by the act, contracts are issued and everything else is handled by Booking Entertainment. Booking Entertainment has enjoyed almost 20 years in the business, and we'd be delighted to make your Anchorage area event an outstanding experience. Once you have an idea of how you want to proceed, simply submit your non-obligatory Entertainment Request Form below. You can select from our broad list of acts and packages, or if you are either uncertain or have a specific act in mind, you can let us know and we will work with you to select the perfect talent for your purposes. Still have questions? We'd be happy to answer them for you. Just email us with any additional questions you might have, so that we can help you make your party or event the best it can be.